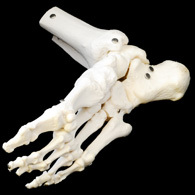 A callus, or tyloma, on the foot is caused by repeated pressure and friction, leading to the build up of thickened skin. The callus, which be may hard, dry or cracked, acts to protect the area underneath it. A corn is similar to a callus but is smaller and appears on toes rather than on the sole of the foot. Your podiatrist can recommend simple over-the-counter treatments such as pads or pumice to decrease the calluses or corn. In severe cases calluses may require regular shaving to keep them from becoming too large.